Brianne Callahan, 38, of Moorestown, New Jersey, suffered a heart attack from Spontaneous Coronary Artery Dissection, commonly known as SCAD, while skiing with her family in Vermont. Brianne Callahan noticed the symptoms. After all, it was difficult to miss the feeling of an elephant sitting on her chest. But she initially failed to recognize the serious message they were sending, figuring she was still getting back into shape after having her fourth child a few months earlier. Despite experiencing shortness of breath and pain in her right arm during a family trip last year, Callahan told herself to push through the pain. She skied a Vermont mountain for another two days. The symptoms persisted even after she returned to her South Jersey home. Still, she waited several more days before heading to Virtua Marlton Hospital – a visit that came only after she lost the vision in one of her eyes. There, she received some startling news. Callahan – now 38 years old – had suffered a heart attack. "They brought me in and started looking at my blood work," said Callahan, of Moorestown, Burlington County. "They told me I had had a heart attack and I was completely dumbfounded." A former collegiate athlete, Callahan had remained physically fit, even completing triathlons. She did not have high cholesterol levels or hypertension. Recent blood work had not revealed any warning signs. Callahan had developed spontaneous coronary artery dissection, an emergency condition that can prompt heart attacks, cardiac arrest or sudden death. The condition, known as SCAD, primarily affects seemingly healthy women who do not display the common risk factors for heart disease. SCAD remains relatively uncommon, accounting for just 1 to 4 percent of all heart attacks. But it causes about one-third of heart attacks among women younger than 50. And the vast majority of its victims are women. Yet, medical experts aren't sure why it occurs. "I think it's very easy for us to invoke the hypothesis that it's related to hormones, but we're not entirely sure what the mechanism is," said Dr. Jennifer Lewey, director of the Women's Cardiovascular Center at Penn Medicine. "It's more common with women and there's associations with pregnancy and postpartum, which suggest hormones are involved. But we just don't know how. "The other question is, is there a genetic link? But, so far, we haven't identified what that link would be." SCAD develops when a tear forms in a vessel supplying blood to the heart, Lewey said. Due to the tear, blood spills between the inner and outer linings of the vessel, prompting a swelling that obstructs blood flow to the heart. That reduces the heart's supply of oxygen, causing the heart attack. That differs from heart attacks caused by atherosclerosis – the hardening of arteries from plaques. The two conditions should be treated differently, Lewey said. During heart attacks caused by atherosclerosis, doctors often insert a stent to relieve the blockage as quickly as possible. But Lewey said that can make the dissection caused by SCAD worse. 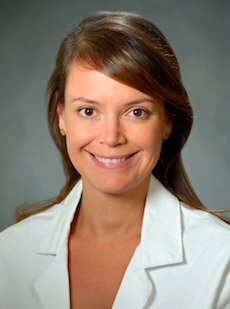 Dr. Jennifer Lewey is the director of the Women's Cardiovascular Center at Penn Medicine. A study published last month by the American Heart Association found that SCAD patients benefit from a more conservative approach – allowing the body to heal on its own. In most cases, the tear caused by SCAD will heal on its own within several weeks or a few months. "In the last 5 to 10 years, there's been an increased awareness around it," Lewey said. "I think people are making the diagnosis more accurately in the hospital, in the cath lab, and that women are learning more about it. I don't think there's an increasing prevalence. I think we're just catching it more." Callahan fortunately encountered a Virtua physician who had recently participated in an educational session on SCAD. Looking at Callahan's cardiac catheterization, he recognized SCAD and provided instructions to the other physicians handling her care. Instead of a stent, Callahan received medications designed to lower her blood pressure and reduce the stress placed on her dissected blood vessel. "I'm so grateful that they were able to diagnose me correctly," Callahan said. "After hearing about all this, I've heard so many stories about people who hadn't been initially diagnosed correctly." Still, Callahan continued to experience pain, so she visited the Hospital of the University of Pennsylvania, where she was referred to Lewey, whose clinical expertise includes SCAD. Lewey adjusted Callahan's medication several times and placed her on bed rest for nearly three months. Lewey helped Callahan recognize the importance of giving her body a chance to heal, Callahan said. In time, she was able to regain many of her previous activities, with some limitations. When she first visited Penn, Callahan needed a wheelchair to get from her car to the physician's office. At home, she couldn't hold her children or walk up the stairs. But now – slightly more than a year after her heart attack – she has received the green light to begin training again. Slowing down – especially with four children – was difficult, Callahan said. But fortunately, she had a support system in place. "I think slowing down and accepting help was one of the bigger challenges to me," Callahan said. "It's not something that I'm programmed to do. That was definitely a challenge. The biggest lesson that I took away from it is that slowing down is OK."
Callahan decided to share her story in hopes of helping other women better recognize the symptoms associated with SCAD – pain or discomfort in the chest, shortness of breath, nausea and vomiting. Sometimes, the pain will move to the back, shoulder or arms. Callahan urged others to seek medical help if they're feeling off. "It doesn't matter how old you are or how fit you are," Callahan said. "This can happen at any time, to any person, for any reason." But she also stressed that recovery from SCAD is possible, encouraging victims to be forward-thinking and positive. "If you do what you're supposed to do," Callahan said, "It can turn out OK."